I LOVE taco salads. I go to Taco Boy at least once a month here in Charleston for their taco salad with lime vinaigrette dressing. I’m always determined to find out how they make it so good so I can recreate it at home. First and foremost, it is all about the toppings! This one is made with charred corn (hello, summer! 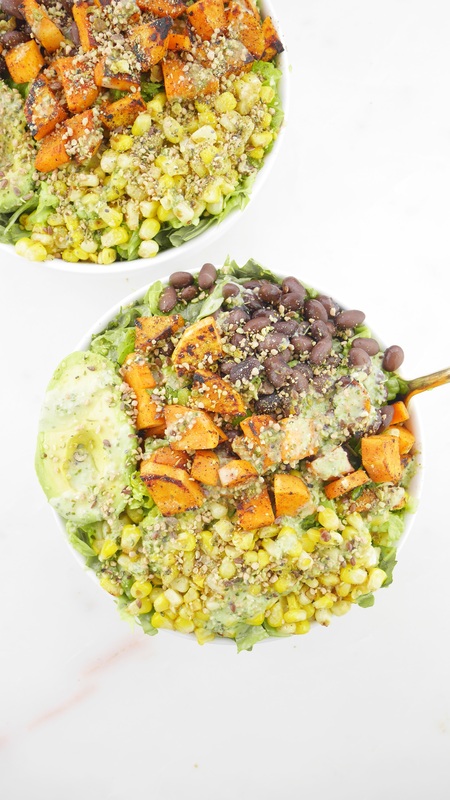 ), sweet potato, black beans and crunchy romaine lettuce. 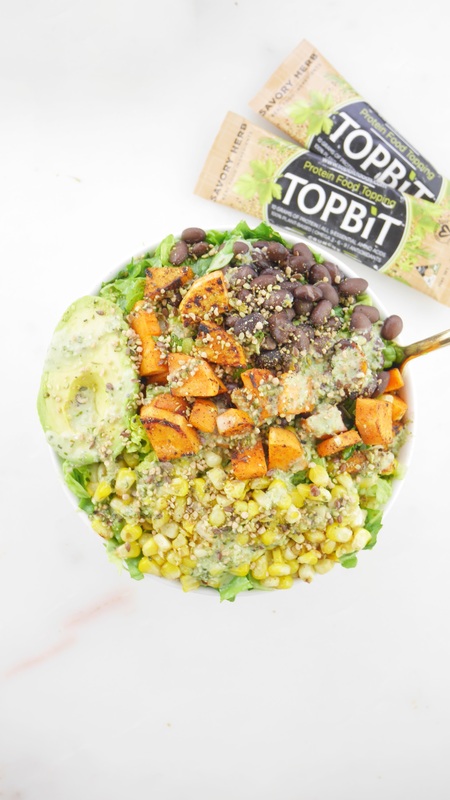 The best part of this salad is that it’s topped with a savory herb seasoning called TOPBiT! 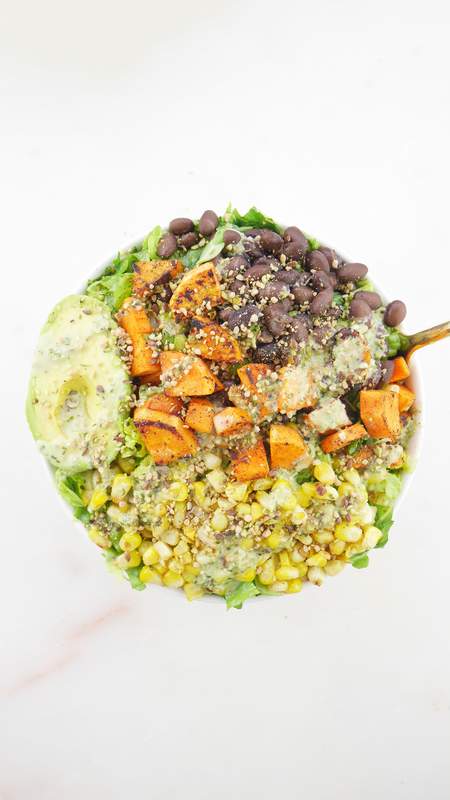 The savory herb variety is made with hemp seeds, chia seeds, flaxseeds, pea, brown rice and lentils . It’s 100% plant-based and vegan with zero sugar. Each pack contains 10 grams of protein, not to mention plenty of those omega-3 fats from the flax + chia. Love taking these on the go and topping pasta, pizza and salads. They also have a mixed berry variety which is great for adding a fruity kick to yogurt and oatmeal. Use code ’20topbit’ for 20% off on Amazon! Warm one tablespoon of olive oil in a medium skillet. Add sweet potato, season with paprika and sauté until charred. Next, add corn and saute until charred. 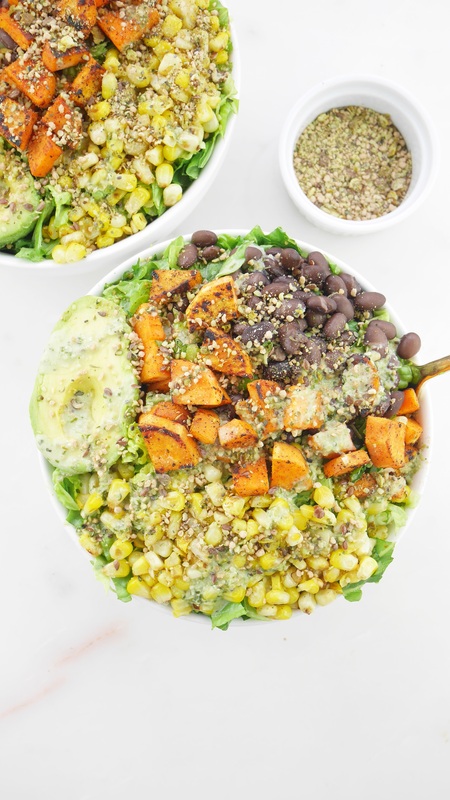 Assemble salad ingredients into bowls. Top each with Savory Herb TOPBiT.